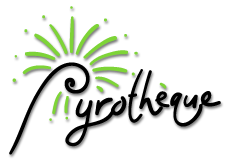 (Barely) in time for the fourth of July, I’d like to announce the first release of Pyrothèque, my new fireworks screen saver for Mac OS X. Four years (off and on) in the making, it’s my favorite OS X project yet; it combines elements of the old and the new in a simple, clean presentation. In short, it’s toasty. Read on for the story. I got the idea for Pyrothèque back in 2002, after I’d finished my first batch of screen savers: a set of homages to my favorite add-ons for the BeOS screen_blanker. In thinking about my fascination with these little distractions, my mind meandered back to 1989, the year I first got my hands on a Mac (the Pluses and SEs in the Eastern I.S. lab, to be precise). Most of the Macs ran John Lim’s free Møire screen saver, but a lucky few ran Pyro!™, a saver from Fifth Generation Systems. It was so simple: a “rocket” (really, just a handful of white pixels) appears at the bottom of the screen, scratches out a lazy parabola, and explodes into a crude ring of sparks. It was downright hypnotic. Occasionally you’d get one or two bonus explosions out of a single launch. Ka-boom! Pyro! inspired competitors in the (briefly profitable) commercial screensavers market; the best known of these is of course Berkeley Systems’ After Dark software (read an early review, circa 1989). In the ensuing screen saver war, Pyro! fell behind and eventually disappeared. After Dark introduced a number of “modules”, including (in version 2.0) Ben Haller‘s Lunatic Fringe (a topic for another day); Pyro! 4.0 also introduced modules, but they were never as compelling (or as numerous) as their After Dark counterparts. The Pyro! denouement goes like this: Symantec bought Fifth Generation in 1993, so it could acquire and destroy 5th’s competing backup software. A casualty of this was Pyro!, which Symantec quickly abandoned. Of course, the entire business of selling a screen saver “platform” dissolved as operating systems began to include their own screen-blanking functionality. (Windows 95 was first to roll it in; BeOS had the aforementioned screen_blanker; Apple was a latecomer here, finally acquiring a screen saver service and API in Mac OS X. Hey, NeXT historians: Was BackSpace, or something similar, ever folded into the OS?) In the end, Pyro! has been (nearly) forgotten, reduced to a mere footnote in the screen saver story. Until now, that is. A few weeks ago I dug up my old fireworks screen saver code (essentially unchanged since late 2002, when I deemed it “good enough” for my own personal use, and promptly forgot all about actually releasing it). I cleaned up the code, made it a Universal Binary, and added some flashy new effects, and the result is Pyrothèque. Go get your retro on! Is there a sound option? Graphics are up to date and it looks cool. Any sound? No sound as of yet. Maybe in a future release; I’ll need to go to a fireworks show and sample some SFX. How about a Universal Binary of Message? Matt: note that all the BeOS screen savers have been updated for PPC and Intel. Stefan: Wow, I hadn’t even considered that those bright flashes might be a problem; I apologize. Keep an eye out on the toastycode blog for a new version of Pyrothèque, probably in the next week or so. toastup! ≈ archives » Setting off the fireworks again. Ahhhhh Lunatic fringe…we used to play this on an old machine we used at work to connect to the internet when we had to….soo much fun to change the sounds and the space ships using Resedit…..those were the days…..
I’ve been thinking about Lunatic Fringe (and its sibling Solarian(?)) a lot lately; I recently realized that a recording of a bicycle kickstand being flipped up is probably what was used for the shield sound effect. ps Since you’re obviously interested in the history of Pyro, I thought I’d tell you how Pyro! actually came about. Steve (Brecher) was writing Suitcase at the time, and his “About…” window was just plain text. I thought it was a shame that such a great program had such a plain about box, so I told him I’d write him a new one. I coded a small fireworks display, and he liked it so much he felt it was wasted on an about box, and suggested a screen saver would be a better home. Steve wrote most of the screen saver code, and I handled most of the animation and cdev (Control Panel) code, and Pyro! 1.0 was born. Steve was a superb coder, and taught me most of what I know about coding. All of Pyro! was written in structured assembly language. Welcome and thanks for the history, Bill. I’m pretty sure that, thanks to your notes, this page is now officially the most up-to-date reference on the history of Pyro! This is a great modern day version of Pyro!™ I now have it running on my Power Mac G4 “QuickSilver” server, while the original Pyro!™ is still running on my venerable 1988 Macintosh SE/30 as well as 1993 Macintosh Color Classic.